In 1991, I did my final essay for my Fine Arts degree at Sydney University. The essay topic (of my own devising) was a little-known film, a film (to my knowledge at the time) that had never been so much as mentioned by Australian art academia – a community quite fixated at the time on a quest for an Australian national ‘identity’ as portrayed by the all-pervading notion of ‘the Landscape’ in Australian art and film. They went on about a string of films they saw as embodying this ‘identity’, a list stretching all the way from the cinematic gem ‘Picnic at Hanging Rock’ to ‘Mad Max’ and ‘Sunday Too Far Away’, to such rotten tomatoes as ‘They’re a Weird Mob’. My essay was on a film they’d left out. And that, indeed, was the singular, foaming-at-the-mouth point of my essay. It wasn’t the world’s best essay (I wasn’t the world’s best student), but it made its point. After handing it in with a copy of the film I’d videoed off a rare TV screening, I met my tutor by chance in a pub and he said he’d enjoyed reading it. (He couldn’t understand why it was the first time he’d read about this film either.) The film was called ‘Wake In Fright’. Though I didn’t know it at the time, the Sydney Uni Fine Arts Department could hardly be blamed for never having caught on to ‘Wake In Fright’. The film had been lost. With its cinema release in 1970, though nominated for the Golden Palm at the Cannes Film Festival in 1971, ‘Wake In Fright’ had not done well at the Australian box office nor, it would seem, internationally. Evidently Australian audiences ran screaming from it, so confronting was the giant mirror it held up to them. Hence, since 1970, it was never reproduced in film format or released on video, only ever (to my knowledge) being shown on TV every now and then until the mid-80s by Australian film presenter par excellence, Bill Collins. So you can imagine my delight to hear recently that the single salvageable copy of ‘Wake In Fright’ known to exist had been found in an obscure U.S. storage facility (along with the Arc of the Covenant, presumably), that the film has been restored, re-printed and is in cinema re-release. I rushed out to see it at a local independent cinema. If you want to see one of the finest, most important films ever made in Australia, so should you. 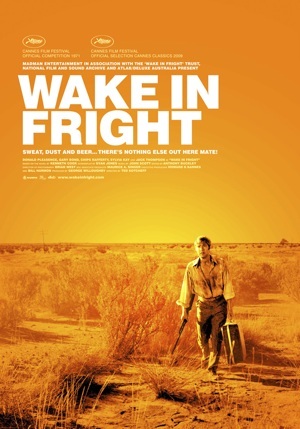 ‘Wake In Fright’ is the story of John Grant, an intelligent and ambitious young man dissatisfied with his lot in life: He is the lone schoolteacher at the one-room schoolhouse of the two-building outback town of Tiboonda, an all-but-deserted outpost of the larger country mining town of Bundanyabba. By John’s own admission, he is ‘a bonded slave of the Australian Department of Education’, his one desire being, at the beginning of the six week Christmas school holidays, to escape Tiboonda, escape teaching, escape Bundanyabba for Sydney, where resides his girlfriend, then escape Sydney for London, where, in John’s mind, resides ‘civilisation’. However, on the eve of his air departure from Bundanyabba, he makes a fatal mistake, what Bill Collins once called a wrong turn at a fork in the road for which John is going to pay, and pay, and pay – possibly for the rest of his life. 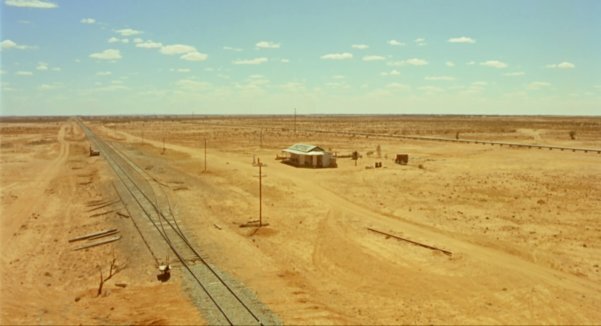 Cinematically, ‘Wake In Fright’ is stunning from its opening shot: From an elevated camera point of view, we see a lone building in the mid-distance. All around it and beyond it to the horizon lies the flat, infertile nothingness of the Australian Outback. To the eerie early synthesizer strains of composer John Scott, the shot then pans very slowly to the right. Taking a full minute, the camera pans through a full 360 degrees of this desolate nothingness, finally coming to rest on the town’s second building by the first, and the train-line running between them. Not unfittingly was the film entitled ‘Outback’ for its initial U.S. release. If there is one word that describes this film, it is Harrowing. Not harrowing as in the harrowing physical violence and terror of the excellent Australian film of 2005, ‘Wolf Creek’, but harrowing in its portrayal of the baseness of human behaviour and in the truths revealed, firstly, about the rough mining town locals John finds himself surrounded by, or, more accurately, seduced by: The false hope they offer him, their fickle hospitality, the offer of a light for his desperate cigarette being from a cigarette lighter flame just a shade off a blow-torch. Secondly, it is harrowing in the truths revealed to John about himself. 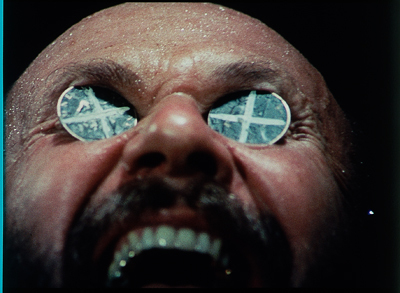 ‘Wake In Fright’ is being called a film of true greatness. My description of it so far may make it sound reminiscent of the classic ‘Deliverance’. 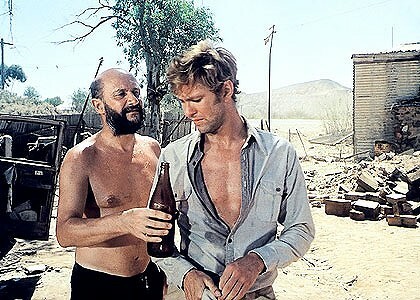 In my opinion, ‘Wake In Fright’ puts ‘Deliverance’ in the shade. The peculiar brand of Australian ‘mateship’ and social goodwill of the outback town locals is cast in another of the film’s opening scenes: John boards a one-carriage train from his schoolhouse outpost bound for the country centre affectionately known by its residents as ‘The Yabba’. Making his way up the train carriage, he passes through a clutch of rowdy but ostensibly friendly local men who try to press a can of beer onto him. John declines it, moving up the aisle and taking his seat at the vacant end of the carriage. Sitting down, he notices across the aisle from him an old Aboriginal man sitting silently and alone, as if segregated, tacitly excluded from the ‘white’ end of the carriage. The old man sits with quiet dignity, nothing else to do but accept his ‘place’ within the carriage: To the whites in the carriage, he isn’t there. Clearly, the old man has accepted his place (or lack of it) on the margins of their society. His Australia is their Terra Nullius – the Land of Nothing. The film’s soundtrack by John Scott is unforgettable. Early in the film, Scott’s music evokes the main character’s exquisite rush of hope, of possible escape and victory. Though the moment is conspicuous within the film, for the tone is chiefly one of eerie desolation. At key points, the soundtrack is nothing short of manic, especially when accompanying the film’s montage sequences – rapid-fire image assaults portraying John Grant’s mental descent. These sequences verge on the psychedelic – though their mode is one of the very worst trip indeed. 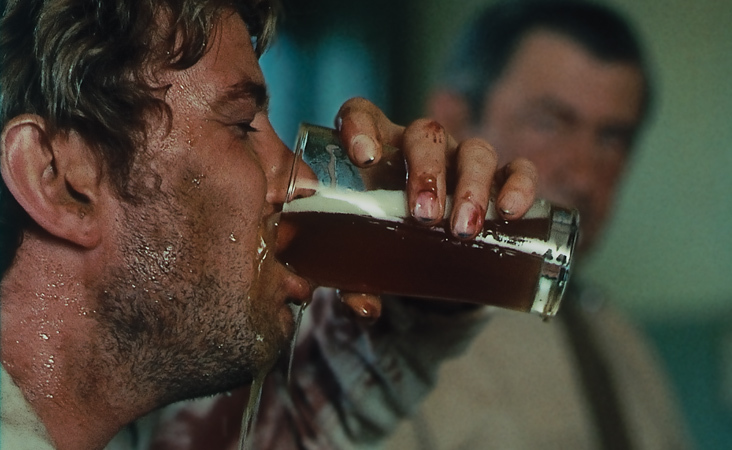 To me, ‘Wake In Fright’ possesses a ‘realness’ about it like no other Australian film, or any other film I can think of: Soon-to-be-legendary is the film’s epic kangaroo hunt. Real animals are slaughtered on film, and not just one like in ‘Apocalypse Now’. Seemingly real is the violent, alcohol-fuelled mania of cast members – Jack Thompson, particularly Donald Pleasence. The doomed daughter, Janette, also the ghoulish, automaton-like motel clerk, these performances must be seen to be believed, not to mention those by John Meillon. Then there is the ‘realness’ of the withered old man on the Main-Street Yabba bench beside which John Grant finds himself sitting, the knotted gaze from the old man that says to the young man, ‘I was once you. You will be me.’ Realness? Unless I’m mistaken, this withered old man is no actor. He is a withered old man of Broken Hill, the town where ‘Wake In Fright’ was filmed. 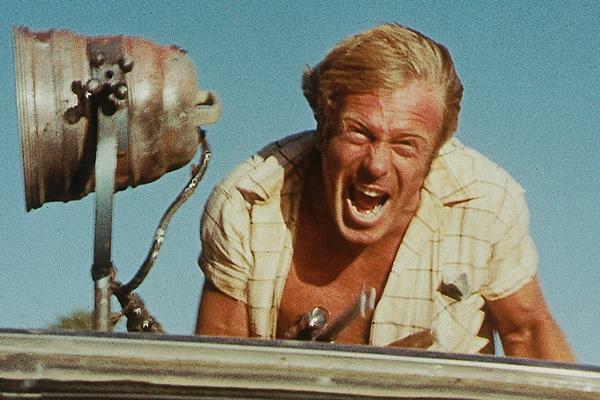 ‘Wake In Fright’ is reminiscent of Hitchcock in mood and atmosphere. For, like that grand master of the cinema, Canadian director Ted Kotcheff (‘Rambo’) exposes that which is fearful, twisted and desperate just beneath the surface of the Ordinary. In my calling this film one of the best films ever made in Australia (as have others recently), I put it to the test: Is this film of the same calibre of Hitchcock’s best work? Does it consistently match the standards of the grand master’s craft, levels which even the greatest films fall narrowly short of? In my opinion, it is, and it does. Now that ‘Wake In Fright’ has been rediscovered after 39 years’ oblivion, I can only hope that the world of Australian film and art academia will retro-award it its rightful place on the film school syllabus. In 1991, I was swimming (drowning) in Australian art theory of the literal ‘O’ of the Outback, the infinite ‘zero’ into which Australian explorers like Burke and Wills had ventured only to disappear – just as Miranda and her school chums in ‘Picnic at Hanging Rock’ had disappeared. By 1991, so had ‘Wake In Fright’. Though beware: Film critic Leonard Maltin once wrote that this film would hardly be likely to be endorsed by the Australian Tourist Commission.